We’ve probably all experienced the problem of food smells lingering around the home after a dinner with family or friends – well, Victorian gentry had the same problem, and the dumbwaiter lift was created as a solution! The food would be conveyed from kitchen to dining room in a sealed service lift whilst the servants took the stairs. Food arrived hot, collisions were reduced and odours were eliminated! Whilst the early use of the dumbwaiter lift was aristocratic, the commercial opportunities it presented were quickly recognised by 19th century entrepreneurs. Soon dumbwaiter lifts were popping up in restaurants, pharmacies, stationers and even the Bank of England where a bespoke version was created to carry the gold bullion from one floor to another. The early entrepreneurs saw a potential in the dumbwaiter lifts which has continued to grow over the past 150 years. They are now commonly used in factories, pubs, restaurants, shops and museums to move heavy goods, fragile goods, or commercial goods that need to be retrieved from the stockroom without taking customer-facing assistants off the shop floor. A rapidly growing market for the commercial lift is the domestic sector. Demand is no longer restricted to grand houses; nowadays they are particularly useful installations for people who need help with lifting, or moving objects in their homes. The simplicity of the original idea has continued to spawn numerous applications across sectors, solving new problems as they arise. The design and installation team weren’t around in the 1880s but they’re certainly advocates of its benefits!! We, like those early Victorian adopters, work with businesses to realise its potential in solving their contemporary problems. Because the challenges tend to be unique, we create bespoke dumbwaiter lifts in order to create an effective solution. If you would like a Dumbwaiter Lift solution, then Call Tower Lifts today on 01525 601099! Where do your goods need to travel from? Where will your goods end up? What goods will the dumbwaiter lift transport? How heavy are the goods the lift will carry? How quickly do the goods need to arrive at their destination? How often will the dumbwaiter lift be used in the course of a day? How many people will need to operate the lift? How much room do you have for installing the dumbwaiter? JD Sports is such a contemporary phenomenon that it seems odd to think that their customer service is powered by the dumbwaiter lift! Tower Lifts has created bespoke lifts in stores across the UK. In Manchester we were asked by San Carlo Fumo restaurant to create 2 ‘invisible’ dumbwaiter lifts to aid the transport of food up a short stairway. We have also created bespoke dumbwaiter lifts for Schuh, residential properties, and food halls. 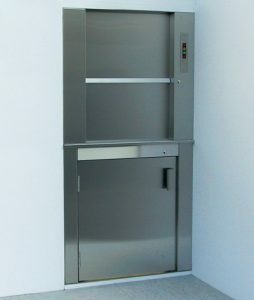 Tower Lifts has been creating bespoke dumbwaiter lifts for nearly two decades now. 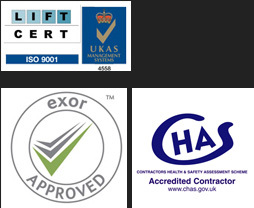 Every lift we install is fitted with safety features to ensure the welfare of staff using it. All our lifts take into account visual, auditory or mobility impairments and are designed with this in mind.